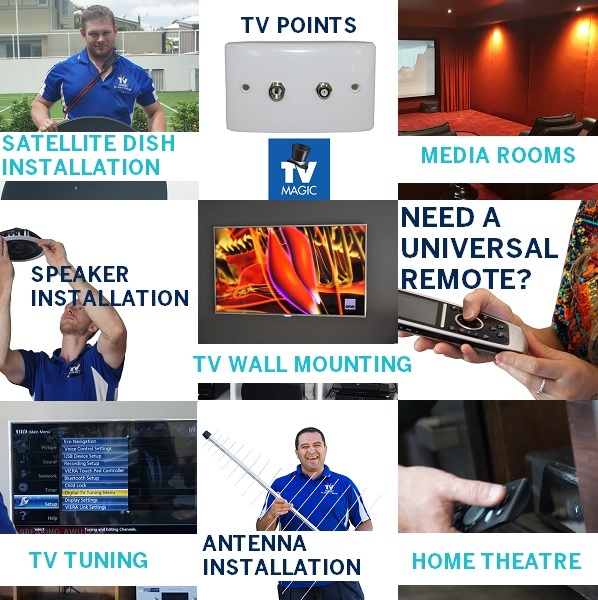 Darrel Marshall, TV Magic technician and antenna installation guru is making a revolutionary impact on TV Magic customer's throughout North Brisbane and around the Redcliffe Peninsula area. Call Darrel on 047671 7671 for all your home theatre and TV antenna installation needs. Darrel joined TV Magic North Brisbane with Matthew Brandon in Early 2016. Darrel has years upon years of experience in the building industry and electronics amongst other things. Darrel's services include: TV Tuning, TV Wall Mounting, Antenna Installation, TV points, Reception Repair, Home theatre setup and installation, media rooms and Phone point installation. TV Magic is a complete tv, antenna and home theatre service. For next day bookings in Caboolture, Mango Hill, Redcliffe, Scarborough, New Beith, Chermside, Aspley, Fitzgibbon, Sandgate, Brighton or any other Northern Brisbane suburb call Darrel directly. Darrel can provide quotes over the phone and if you're happy to get the work done on an agreeable quote, he will even come out for a free quote. Call Darrel today. Meet Darrel Marshall. Darrel is one of the most cheerful blokes we know! He doesn't take himself too seriously and he's not afraid to get his hands dirty either! Darrel services North Brisbane, surrounds and there's no questioning that Darrel has a few fans! Read on to learn more about Darrel. So Darrel, What were you doing before TV Magic? Now Mr Marshall, how long have you been with TV Magic? And what is your favourite job to do? Ok, and what would you say Darrel Marshall's favourite TV show would be? I'm too busy to watch TV! My 3 boys are at the stage where they just want to play anything...... With Dad. But I will put everything on hold when the All Blacks play! Ok, now can you tell us something that not many people know about you? Great, what about your favourite experience with a customer? I once went to do a job for a lovely old couple, who look after their daughter's 3 small kids and couldn't get TV reception. We thought it might be a faulty antenna problem. Money was tight for them as they were pensioners and looked after 3 small kids full time. After doing all of my testing, I found that it was a connection problem and fixed the problem for a fraction of the price. Happy customers and even happier kids. It's always a good feeling when that happens. Describe your average day at work in three words.